Twinkling lights and jolly red Santas are everywhere at this time of year. The smell of cinnamon, pine and Christmas cookies fills the air. Who doesn’t love the holidays? Well, if you happen to be selling your house, it could be those prospective buyers stopping by for a showing. That’s not to say that December homebuyers are all Grinches. In fact, many house hunters enjoy the season every bit as much as you do. But—and this is important—they might not enjoy it in the same way as you. When you drive down the street at this time of year you’re sure to see a wide variety of holiday decorating styles—from extravagant to understated. And the same will be true on the inside. Some people will have lights and wreaths and knickknacks everywhere. And others, well, not so much. So if you love the season there’s no reason you can’t decorate just because you’re selling your house. But… the trick is to keep it simple and tasteful. Just ask your realtor. You may remember that one of the first rules of selling your home is to de-clutter. And if you go to all that work (and yes, it is work) to make your house look clean and clutter-free, the last thing you’re going to want to do is fill it all back up with holiday trinkets. December is traditionally a little slow for real estate. But the good news is that the house-hunters that are out there are probably pretty serious about making a move. Which means you don’t want to turn them off by presenting your property in a bad light. So celebrate the season—but stick with classy over trashy. Well this is up to you. But if you choose to put one up, make it a small one. An 8-footer is going to take up a lot of space—and make the whole room look small. Your realtor probably told you to keep the house neutral and remove personal items so buyers can picture themselves living here. That advice applies to Christmas as well. Trimming the tree with lights and colored balls will make your house show better than using all those paper ornaments your kids have made over the last 20 years. And there’s really no good place to display that drawer-dropping Santa that you got in last year’s White Elephant exchange. If Santa still stops at your house, most of the gifts may be hidden away already, but if not, don’t pile them under the tree. It can give the wrong impression, look cluttered and be risky. So set the real gifts aside. If you like the look of a few gifts under the tree – and you’re a good wrapper—wrap up a handful of empty boxes to complete the picture. Red and green doesn’t look good with everything! Don’t decorate with a lot of Christmas items that clash with the color—or feel—of your room! Line a mantle with evergreen boughs or put an elegant wreath on your front door. These touches will make your house look inviting rather than overwhelming. No, no, no. Lighting candles is not a good idea. You don’t want to leave your home with candles burning. It’s dangerous—and not everyone likes the strong scent they give off. What a great invention! These (usually white or off-white) candles look like the real thing, but run on batteries. They’re safe and elegant and cozy—the perfect holiday touch when you’re showing your house. Some people like the smell of pumpkin spice while others gravitate toward evergreen scents. But don’t risk making the wrong choice! Many realtors suggest baking bread or cookies before a showing. Stick with this idea for the holidays, as well. If you want to add a little holiday spirit to that fresh-baked smell, then bake cinnamon rolls! Warm, cozy and seasonal—the best of both worlds! All the staging, de-cluttering, and decorating that you do on the inside will be pointless if your prospective buyers are deterred by the outside. This isn’t the time to make your house look like it’s straight out of National Lampoon’s Christmas Vacation. Put those 250 strands of lights where they belong—packed up to use at your next house. And just say no to those giant blow-up snowmen. It’s bad enough when your MLS photo shows your house surrounded by snow. But if there’s snow on the ground when you decide to list, that can’t be helped. But don’t fill your interior photos with Christmas decorations! You don’t want to let seasonal clutter distract from the qualities you’re trying to show off. And if your house doesn’t sell for a while, Christmas decorations are a telltale sign of how long your house has been on the market. So enjoy the holidays, but when selling your house just keep those decorations to a minimum. Think warm and cozy versus big and splashy. 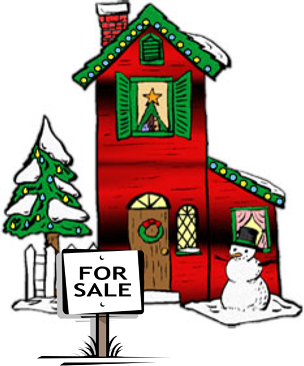 Hopefully, the results will pay off in the best Christmas present ever—the sale of your house!